If you’re willing to pound the pavement from dusk-till-dawn, and do a little planning, it’s possible to cover a lot of ground and see a lot of big city sights in an extended weekend. Here’s our top eight places to check out in San Francisco if you’re short on time. Chinatown – Wander your way up Nob Hill to Chinatown and check out the amazing spices on display at the market. There is great architecture and authentic décor, as well as shop keepers selling their wares. We were lucky enough to be there for a parade celebrating Chinese New Year. Coit Tower – For breathtaking views of the bay and Golden Gate Bridge, Alcatraz, and San Francisco’s expansive skyline, hike up Telegraph Hill to Coit Tower. There is a $10/pp admission fee to go to the top of the tower, but the area around the tower has views that are just as impressive. Alcatraz – Alcatraz has a very dark history. A short ferry ride will take you to Alcatraz where you can enjoy a guided tour or do an audio tour on your own. Enjoy the opposite view Coit Tower offers and look back on the city from The Rock. Golden Gate Park –What a perfect place for exploring! This park has hiking trails, a stream and waterfall, Japanese Tea Garden, Conservatory of Flowers, meadows, paddocks, and more. We were here for hours and only covered a small portion of the park. It’s located in the Haight-Ashbury neighborhood, which is filled with trendy shops and hippie culture. Alamo Square/Painted Ladies – This is the perfect place to rest for a bit and enjoy the view. The Painted Ladies are iconic Victorian houses, with a view of the financial district in the background. Fisherman’s Wharf- Pier 39 is famous for the swarm of sea lions that sun themselves here. They are super cute and fun to watch. From here, you can work your way over to Ghirardelli Square and rest in the park, before heading up to the Ghirardelli store. This place is heaven for chocolate lovers, but plan to stand in line for at least a hour to get a shake. The Buena Vista Café is another great stop in the area. You can work all those sweets off by hiking up to Lombard Street – the crooked street. Union Square – A great area for people watching, shopping, and great food! There’s a subway stop nearby too. Here you can find many flagship stores, and wonderful hotels and food – like the dessert burger at Burger Bar. Be sure to check out Blondie’s Pizza for what some say is the best pizza in the area. We stayed in Union Square, which tends to be super expensive, but we found a great deal at the Chancellor Hotel. Cable Cars – I don’t think a trip to San Francisco would be complete without at least one ride on an iconic cable car, and now this can be crossed off my bucket list! And, at the end of the day when you’re exhausted and can’t walk anymore, these provide a nice alternative to a cab. We skipped the line at Ghirardelli Square and hopped on at the top of Lombard Street instead. They cost $6 per rider, but the experience is worth it. Because we both work full time, we have become expert weekend warriors. We covered all of this from early Friday evening to late Sunday afternoon, not including Saturday night, during which my hubby surprised me with a concert in Oakland! There’s still tons to see and do in San Francisco and the surrounding area. 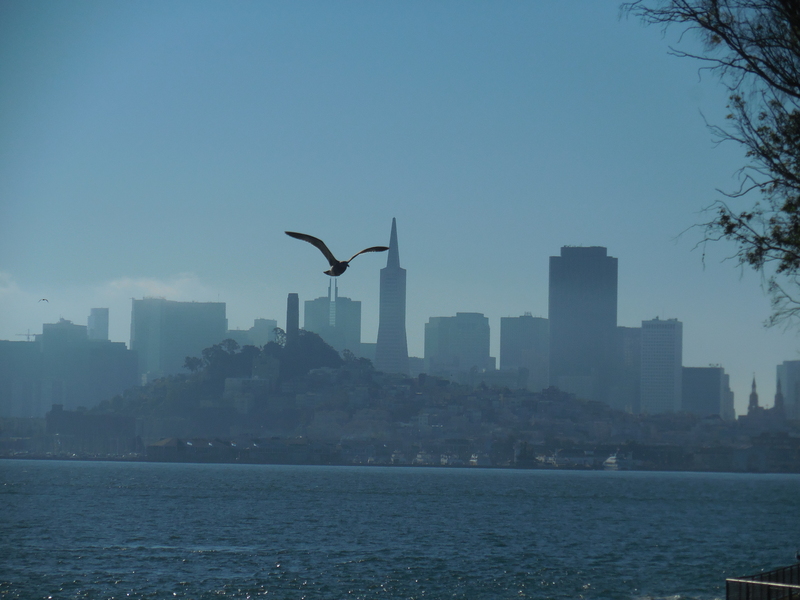 Can’t wait to go back some day – we definitely left a piece of our hearts in San Francisco! Have a great trip! Thank you! Hopefully, you got some ideas and will have a great trip! Thanks for following too!! Thank you! I know how planning goes… We are trying to plan our next trip right now! That’s the hardest part – we haven’t decided yet! But, we are hoping to go in May, which is coming up fast!! I’m sure you’ll think of somewhere! Yes! We are torn between Europe and Asia! We’d come to Australia if we had the $!